Davenport, IA - I’m a Dirt Late Model fan first and a dirt racing fan second, which doesn’t really make sense at all. For me it’s always been about Stock Cars and Stock Cars have fenders. Not just any fenders but front fenders, even hoods and roofs. It’s been a long time since the modern Stock Car truly resembled anything stock appearing outside the stickers used for grills, head lights and the obscene manufacture marque name badge on the front nose. You have to be old to remember stock in Stock Car. Today they are just called Late Models and that in itself is funny because that too is a carryover from the Stock Car days. Back then the top class was called Late Model and the cars had to be within a few years of modern and not the Old Model cars that would run for ever in the Sportsman class. So today we have Late Models and that is broken down into Open Motor, Crate Motor and various other Spec Motor combinations. The cars are similar outside of the motor and how much money you want to throw at everything else like shocks, shocks and maybe a few other high dollar parts that need to be bolted on. The biggest thing all boils down to money and where you want to race, who you want to race with, how far you want to travel to race or what racing rule Island you want to race on. It’s not simple like it was back in the 1980’s and 1990’s when a Dirt Late Model was a DIRT LATE MODEL and they were the same everywhere. The cost of everything has changed racing and for everyone that calls the circus their home. We’re seeing more regional drivers stay closer to home and adjusting their plans to race at weekly events. 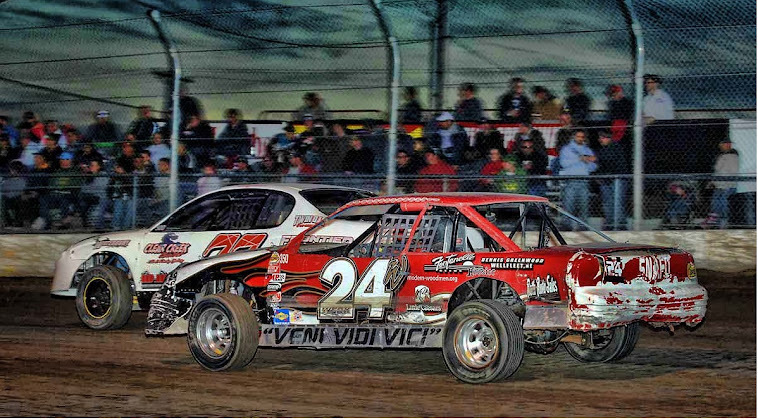 We’re seeing more national drivers staying closer to home and racing in the region. We’re seeing drivers change their cars to fit the rules that are required on their racing Island. We’re seeing racers with multiple cars so they can race in different divisions like Modifieds and we’re seeing this in reverse with Mod drivers doing Late Model. It’s just the way things have to be to keep racing. These are dangerous times and the cost of racing is out of control. For those of us who follow the circus from town to town there is no difference. Every fan has a division of choice that they like to follow. Racing NEEDS butts in the bleacher seats to survive and the cost of going to race after race is just too expensive. Nothing beats live racing but more people are picking and choosing what races they can afford to go to and when they can’t go they stay home for the Internet version. Unfortunately if more people stay home then at some point there will be no racing. Since I’m writing this column I can make this all about me and the changes I’ve had to make to keep racing. To do so I’ve had to rethink what races I can go too based on cost of travel and time. I would like nothing more than to keep going to all the BIG SHOWS and all the regional shows but that’s just not making sense. I’ve had to readjust my thinking and look at the closer races and even think outside the box. The "outside the box" means going to Modified and Sprint Car shows that happen close to home and be happy that I have racing on DIRT still to enjoy. It’s all good and I’m okay with that and just maybe I’ll be the DIRT RACING fan that I truly want to be. This all leads me to the point I want to make and it’s about “The Greatest Show on Dirt”. A few weeks back I was able to go to the World of Outlaws Sprint car show at 34 Raceway in West Burlington, Iowa. I had not been to an Outlaws Show since 2009 and with the 410 Hot Rods just down the road I made the trip with my friends Darrel and Merle Unzel. It turned into the type of event and race that made me appreciate even more who the Winged Warriors are and what they do for a living on the long and lonesome road during the World of Outlaw Sprint Car season. I use the word circus with a traveling series and the Outlaws are just that. The tents go up, the carnival gets ready and the show is managed to be the best it can be. The fact that the series has the very best Sprint Car teams and Drivers in the world is an understatement. These teams and drivers get with it and the burning desire to go FAST and WIN is the racing DNA that makes this series what it still is today. When you say, “Outlaws” in the world of racing everyone knows just who and what you’re talking about. When they come to your town you also know what you’re getting. With Steve Kinser and Sammy Swindell as racing legends the cornerstone is solid. Put in Donny Schatz, Daryn Pittman, Paul McMahan, Craig Dollansky, Joey Saldana to name a few and night becomes special. One of the things I like about Sprint Car racing is the respect they have to the sport and the cars. They look like they look and have been that way for a very long time. Outside of a motor swap, the 305, 360 and 410 cars look the same and many cars go back and forth between divisions. If 410’s are the King’s choice it doesn’t mean the 360’s are no slouch. They might 50 cubic inches smaller but the racing is full throttle and the same can be said for the 305’s. With Craig Dollansky winning that night in front of a packed 34 Raceway crowd, I have to admit I was a little jealous. The event as a whole with tailgaters, motor homes, souvenir trailers and banners had the BIG race appeal. Outside the Late Model Crown jewels, I think we’ve lost that appeal as many $5,000 and $10,000 to win races look just like another race and specials are not special. The “Greatest Show on Dirt” is rightfully earned by the Outlaws and that’s okay with me. I hope to get back to more Outlaw shows in the months and years to come when they are in my area. There was a time in the history of Late Model racing that could have been a rival but the days of Hav-A-Tampa are long gone. Since it is unlikely that the cigar will ever be re-lit then to the victor goes the spoils.